Augmented reality (AR) helps you do more with what you see by overlaying digital content and information on top of the physical world. For example, AR features coming to Google Maps will let you find your way with directions overlaid on top of your real world. With Playground - a creative mode in the Pixel camera -- you can use AR to see the world differently. And with the latest release of YouTube Stories and ARCore's new Augmented Faces API you can add objects like animated masks, glasses, 3D hats and more to your own selfies! One of the key challenges in making these AR features possible is proper anchoring of the virtual content to the real world; a process that requires a unique set of perceptive technologies able to track the highly dynamic surface geometry across every smile, frown or smirk. To make all this possible, we employ machine learning (ML) to infer approximate 3D surface geometry to enable visual effects, requiring only a single camera input without the need for a dedicated depth sensor. This approach provides the use of AR effects at realtime speeds, using TensorFlow Lite for mobile CPU inference or its new mobile GPU functionality where available. This technology is the same as what powers YouTube Stories' new creator effects, and is also available to the broader developer community via the latest ARCore SDK release and the ML Kit Face Contour Detection API. Our ML pipeline consists of two real-time deep neural network models that work together: A detector that operates on the full image and computes face locations, and a generic 3D mesh model that operates on those locations and predicts the approximate surface geometry via regression. Having the face accurately cropped drastically reduces the need for common data augmentations like affine transformations consisting of rotations, translation and scale changes. Instead it allows the network to dedicate most of its capacity towards coordinate prediction accuracy, which is critical to achieve proper anchoring of the virtual content. 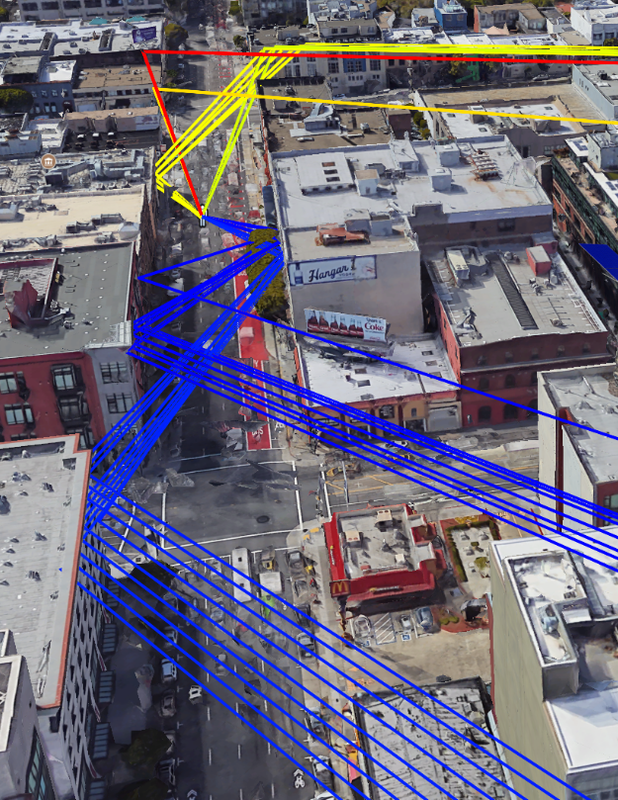 Once the location of interest is cropped, the mesh network is only applied to a single frame at a time, using a windowed smoothing in order to reduce noise when the face is static while avoiding lagging during significant movement. For our 3D mesh we employed transfer learning and trained a network with several objectives: the network simultaneously predicts 3D mesh coordinates on synthetic, rendered data and 2D semantic contours on annotated, real world data similar to those MLKit provides. The resulting network provided us with reasonable 3D mesh predictions not just on synthetic but also on real world data. All models are trained on data sourced from a geographically diverse dataset and subsequently tested on a balanced, diverse testset for qualitative and quantitative performance. The 3D mesh network receives as input a cropped video frame. It doesn't rely on additional depth input, so it can also be applied to pre-recorded videos. The model outputs the positions of the 3D points, as well as the probability of a face being present and reasonably aligned in the input. A common alternative approach is to predict a 2D heatmap for each landmark, but it is not amenable to depth prediction and has high computational costs for so many points. We further improve the accuracy and robustness of our model by iteratively bootstrapping and refining predictions. That way we can grow our dataset to increasingly challenging cases, such as grimaces, oblique angle and occlusions. Dataset augmentation techniques also expanded the available ground truth data, developing model resilience to artifacts like camera imperfections or extreme lighting conditions. We use TensorFlow Lite for on-device neural network inference. The newly introduced GPU back-end acceleration boosts performance where available, and significantly lowers the power consumption. Furthermore, to cover a wide range of consumer hardware, we designed a variety of model architectures with different performance and efficiency characteristics. 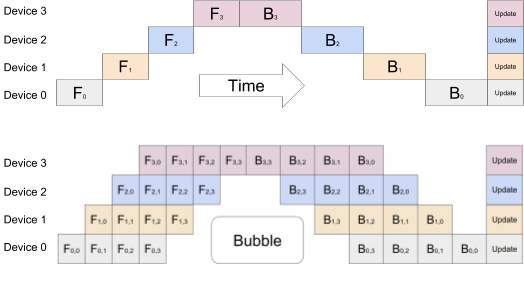 The most important differences of the lighter networks are the residual block layout and the accepted input resolution (128x128 pixels in the lightest model vs. 256x256 in the most complex). We also vary the number of layers and the subsampling rate (how fast the input resolution decreases with network depth). The result of these optimizations is a substantial speedup from using lighter models, with minimal degradation in AR effect quality. Comparison of the most complex (left) and the lightest models (right). Temporal consistency as well as lip and eye tracking is slightly degraded on light models. Modelling face occlusions to hide virtual object parts behind a face, e.g. virtual glasses, as shown below. Case study comparing real make-up against our AR make-up on 5 subjects under different lighting conditions. We are excited to share this new technology with creators, users and developers alike, who can use this new technology immediately by downloading the latest ARCore SDK. In the future we plan to broaden this technology to more Google products. We would like to thank Yury Kartynnik, Valentin Bazarevsky, Andrey Vakunov, Siargey Pisarchyk, Andrei Tkachenka, and Matthias Grundmann for collaboration on developing the current mesh technology; Nick Dufour, Avneesh Sud and Chris Bregler for an earlier version of the technology based on parametric models; Kanstantsin Sokal, Matsvei Zhdanovich, Gregory Karpiak, Alexander Kanaukou, Suril Shah, Buck Bourdon, Camillo Lugaresi, Siarhei Kazakou and Igor Kibalchich for building the ML pipeline to drive impressive effects; Aleksandra Volf and the annotation team for their diligence and dedication to perfection; Andrei Kulik, Juhyun Lee, Raman Sarokin, Ekaterina Ignasheva, Nikolay Chirkov, and Yury Pisarchyk for careful benchmarking and insights on mobile GPU-centric network architecture optimizations. This entry was posted in Research Blog and tagged augmented reality, Computer Vision, Machine Perception, Research, YouTube on March 8, 2019 by Google AI Blog. Neural networks have become the de facto standard for image-related tasks in computing, currently being deployed in a multitude of scenarios, ranging from automatically tagging photos in your image library to autonomous driving systems. These machine-learned systems have become ubiquitous because they perform more accurately than any system humans were able to directly design without machine learning. But because essential details of these systems are learned during the automated training process, understanding how a network goes about its given task can sometimes remain a bit of a mystery. 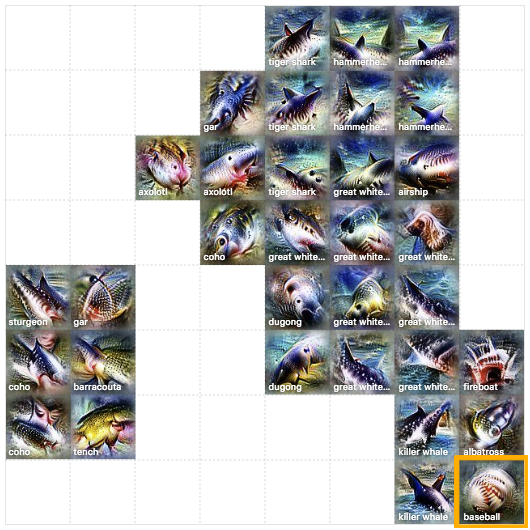 Today, in collaboration with colleagues at OpenAI, we're publishing "Exploring Neural Networks with Activation Atlases", which describes a new technique aimed at helping to answer the question of what image classification neural networks "see" when provided an image. Activation atlases provide a new way to peer into convolutional vision networks, giving a global, hierarchical, and human-interpretable overview of concepts within the hidden layers of a network. We think of activation atlases as revealing a machine-learned alphabet for images — an array of simple, atomic concepts that are combined and recombined to form much more complex visual ideas. We are also releasing some jupyter notebooks to help you get you started in making your own activation atlases. A detail view of an activation atlas from one of the layers of the InceptionV1 vision classification network. It reveals many of the visual detectors that the network uses to classify images, such as different types of fruit-like textures, honeycomb patterns and fabric-like textures. 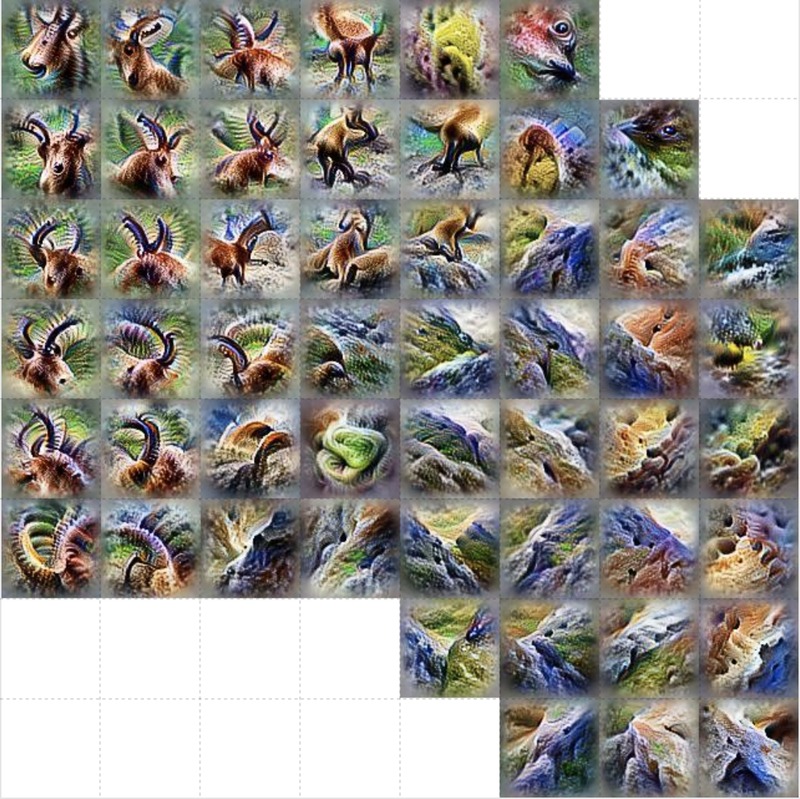 The activation atlases shown below are built from a convolutional image classification network, Inceptionv1, that was trained on the ImageNet dataset. 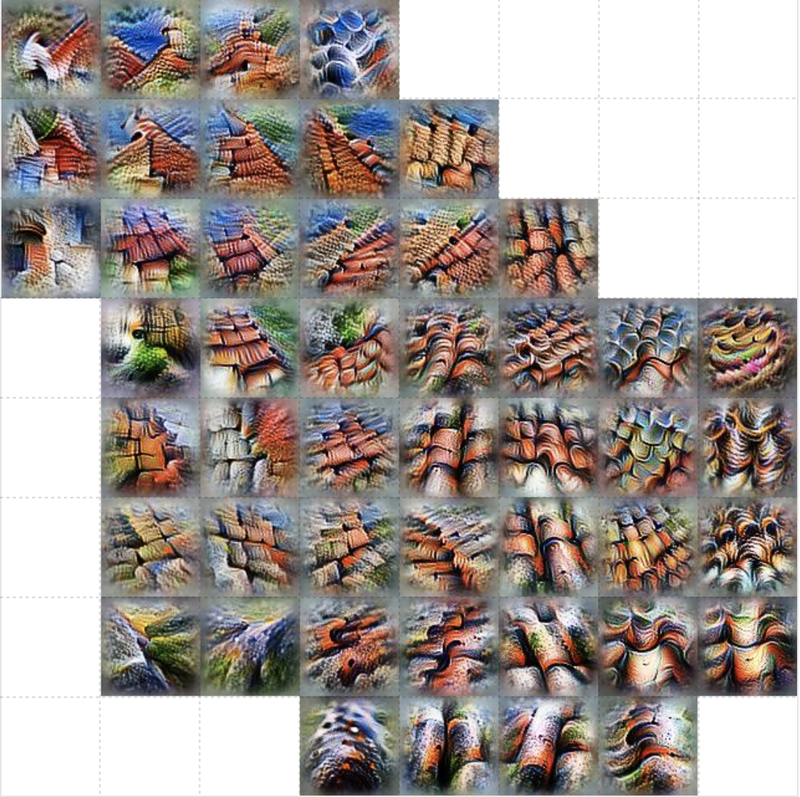 In general, classification networks are shown an image and then asked to give that image a label from one of 1,000 predetermined classes — such as "carbonara", "snorkel" or "frying pan". 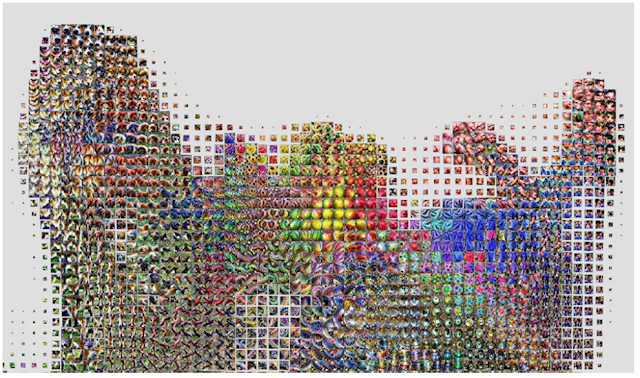 To do this, our network evaluates the image data progressively through about ten layers, each made of hundreds of neurons that each activate to varying degrees on different types of image patches. One neuron at one layer might respond positively to a dog's ear, another at an earlier layer might respond to a high-contrast vertical line. An activation atlas is built by collecting the internal activations from each of these layers of our neural network from one million images. These activations, represented by a complex set of high-dimensional vectors, is projected into useful 2D layouts via UMAP, a dimensionality-reduction technique that preserving some of the local structure of the original high-dimensional space. This takes care of organizing our activation vectors, but we also need to aggregate them into a more manageable number — all the activations are too many to consume at a glance. To do this, we draw a grid over the 2D layout we created. For each cell in our grid, we average all the activations that lie within the boundaries of that cell, and use feature visualization to create an iconic representation. Below we can see an activation atlas for just one layer in a neural network (remember that these classification models can have half a dozen or more layers). It reveals a universe of the visual concepts the network has learned to classify images at this layer. This atlas can be a bit overwhelming at first glance — there's a lot going on! This diversity is a reflection of the variety of visual abstractions and concepts the model has developed. An overview of an activation atlas for one of the many layers (mixed4c) within Inception v1. It is about halfway through the network. In this detail, we can see detectors for different types of leaves and plants. Here we can see different detectors for water, lakes and sandbars. Here we see different types of buildings and bridges. As we mentioned before, there are many more layers in this network. Let's look at the layers that came before this one to see how these concepts become more refined as we go deeper into the network (Each layer builds its activations on top of the preceding layer's activations). In an early layer, mixed4a, there is a vague "mammalian" area. By the next layer in the network, mixed4b, animals and people have been disentangled, with some fruit and food emerging in the middle. By layer mixed4c these concepts are further refined and differentiated into small "peninsulas". Here we've seen the global structure evolve from layer to layer, but each of the individual concepts also become more specific and complex from layer to layer. If we focus on the areas of three layers that contribute to a specific classification, say "cabbage", we can see this clearly. Left: This early layer is very nonspecific in comparison to the others. Center: By the middle layer, the images definitely resemble leaves, but they could be any type of plant. Right: By the last layer the images are very specific to cabbage, leaves curved into rounded balls. There is another phenomenon worth noting: not only are concepts being refined as you move from layer to layer, but new concepts seem to be appearing out of combinations of old ones. You can see how sand and water are distinct concepts in a middle layer, mixed4c (left and center), both with strong attributions to the classification of "sandbar". Contrast this with a later layer (right), mixed5b, where the two ideas seem to be fused into one activation. 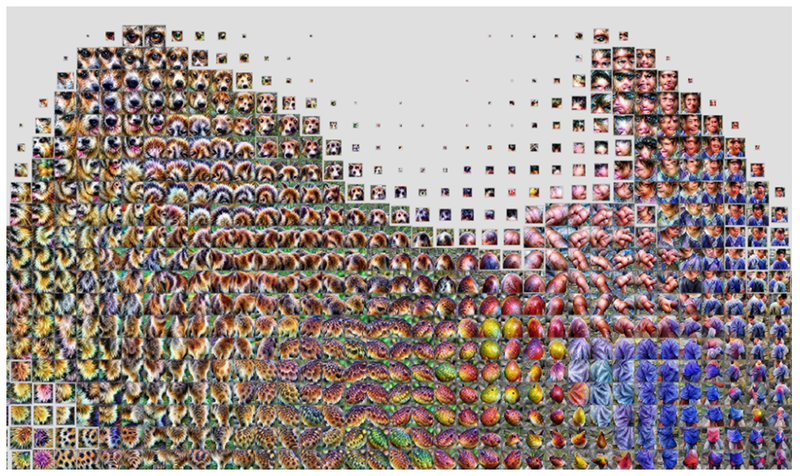 Instead of zooming in on certain areas of the whole atlas for a specific layer, we can also create an atlas at a specific layer for just one of the 1,000 classes in ImageNet. 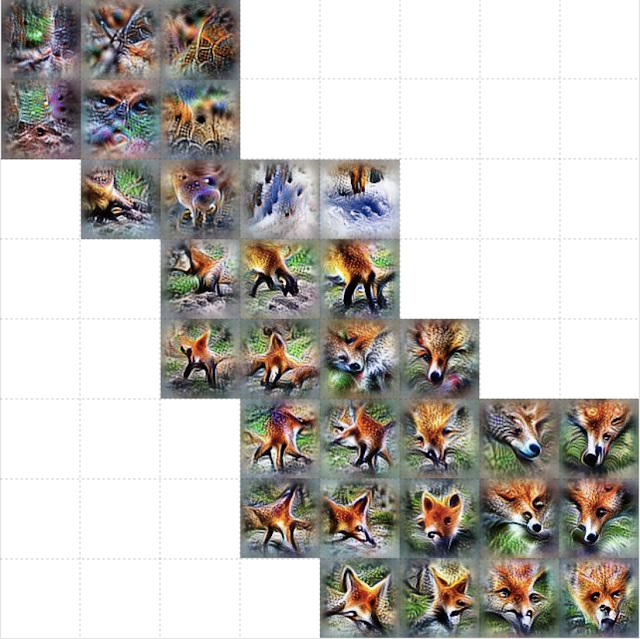 This will show the concepts and detectors that the network most often uses to classify a specific class, say "red fox" for instance. Here we can more clearly see what the network is focusing on to classify a "red fox". There are pointy ears, white snouts surrounded by red fur, and wooded or snowy backgrounds. Here we can see the many different scales and angles of detectors for "tile roof". For "ibex", we see detectors for horns and brown fur, but also environments where we might find such animals, like rocky hillsides. 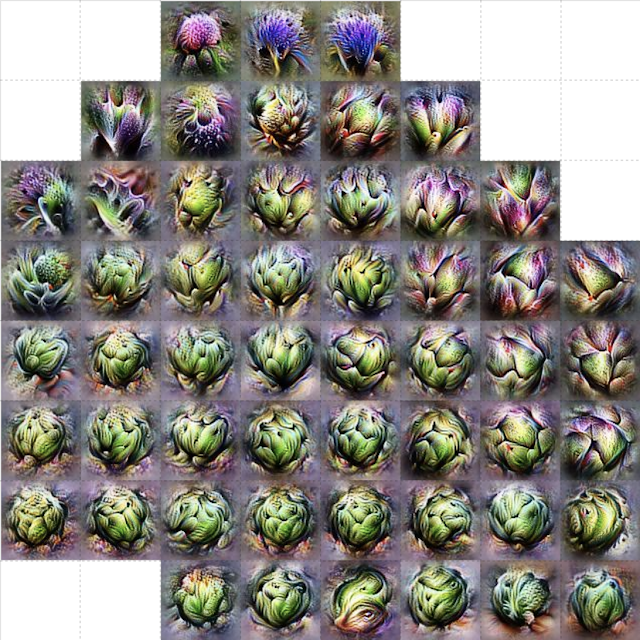 Like the detectors for tile roof, "artichoke" also has many different sizes of detectors for the texture of an artichoke, but we also get some purple flower detectors. These are presumably detecting the blossoms of an artichoke plant. These atlases not only reveal nuanced visual abstractions within a model, but they can also reveal high-level misunderstandings. For example, by looking at an activation atlas for a "great white shark" we water and triangular fins (as expected) but we also see something that looks like a baseball. This hints at a shortcut taken by this research model where it conflates the red baseball stitching with the open mouth of a great white shark. 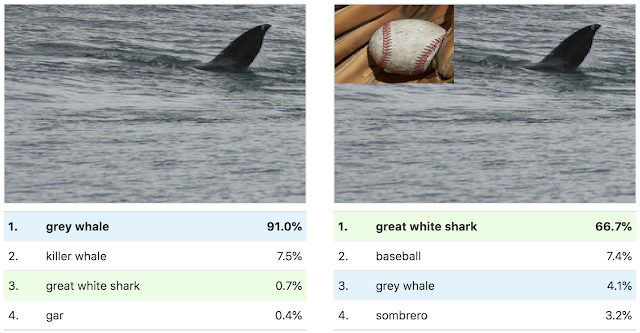 We can test this by using a patch of an image of a baseball to switch the model's classification of a particular image from "grey whale" to "great white shark". We hope that activation atlases will be a useful tool in the quiver of techniques that are making machine learning more accessible and interpretable. To help you get started, we've released several jupyter notebooks which can be executed immediately in your browser with one click via colab. They build upon the previously released toolkit Lucid, which includes code for many other interpretability visualization techniques included as well. We're excited to see what you discover! 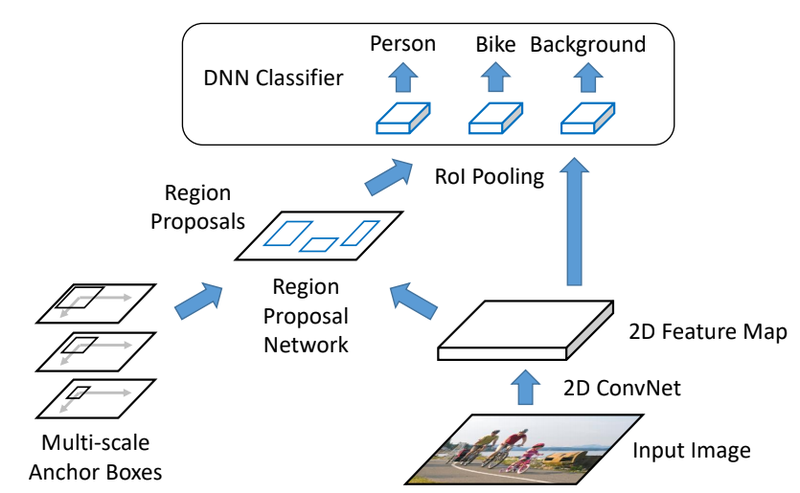 This entry was posted in Research Blog and tagged Computer Vision, Image Classification, Research, Visualization on March 6, 2019 by Google AI Blog. 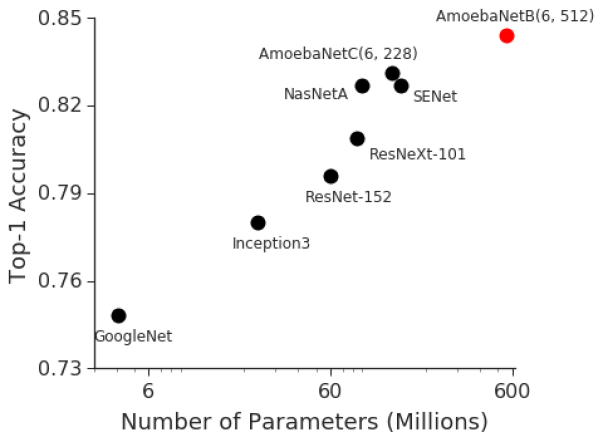 This entry was posted in Research Blog and tagged Computer Vision, deep learning, Google Brain, Research on March 4, 2019 by Google AI Blog. 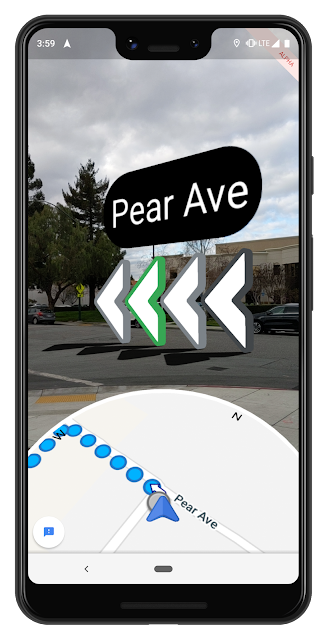 This entry was posted in Research Blog and tagged augmented reality, Computer Vision, Google Maps, Machine Perception, Research on February 11, 2019 by Google AI Blog. Life is full of meaningful moments — from a child’s first step to an impromptu jump for joy — that one wishes could be preserved with a picture. However, because these moments are often unpredictable, missing that perfect shot is a frustrating problem that smartphone camera users face daily. Using our experience from developing Google Clips, we wondered if we could develop new techniques for the Pixel 3 camera that would allow everyone to capture the perfect shot every time. Top Shot is a new feature recently launched with Pixel 3 that helps you to capture precious moments precisely and automatically at the press of the shutter button. Top Shot saves and analyzes the image frames before and after the shutter press on the device in real-time using computer vision techniques, and recommends several alternative high-quality HDR+ photos. Examples of Top Shot on Pixel 3. On the left, a better smiling shot is recommended. On the right, a better jump shot is recommended. The recommended images are high-quality HDR+ shots. When you press the shutter button, Top Shot captures up to 90 images from 1.5 seconds before and after the shutter press, selecting up to two alternative shots to save in high resolution — the original shutter frame and high-res alternatives for you to review (other lower-res frames can also be reviewed as desired). The shutter frame is processed and saved first. The best alternative shots are saved afterwards. Google’s Visual Core on Pixel 3 is used to process these top alternative shots as HDR+ images with a very small amount of extra latency, and are embedded into the file of the Motion Photo. Top-level diagram of Top Shot capture. Given Top Shot runs in the camera as a background process, it must have very low power consumption. As such, Top Shot uses a hardware-accelerated MobileNet-based single shot detector (SSD). The execution of such optimized models is also throttled by power and thermal limits. When we set out to understand how to enable people to capture the best moments with their camera, we focused on three key attributes: 1) functional qualities like lighting, 2) objective attributes (are the subject's eyes open? Are they smiling? ), and 3) subjective qualities like emotional expressions. We designed a computer vision model to recognize these attributes while operating in a low-latency, on-device mode. During our development process, we started with a vanilla MobileNet model and set out to optimize for Top Shot, arriving at a customized architecture that operated within our accuracy, latency and power tradeoff constraints. Our neural network design detects low-level visual attributes in early layers, like whether the subject is blurry, and then dedicates additional compute and parameters toward more complex objective attributes like whether the subject's eyes are open, and subjective attributes like whether there is an emotional expression of amusement or surprise. We trained our model using knowledge distillation over a large number of diverse face images using quantization during both training and inference. We then adopted a layered Generalized Additive Model (GAM) to provide quality scores for faces and combine them into a weighted-average “frame faces” score. This model made it easy for us to interpret and identify the exact causes of success or failure, enabling rapid iteration to improve the quality and performance of our attributes model. The number of free parameters was on the order of dozens, so we could optimize these using Google's black box optimizer, Vizier, in tandem with any other parameters that affected selection quality. Subject motion saliency score — the low-resolution optical flow between the current frame and the previous frame is estimated in ISP to determine if there is salient object motion in the scene. Global motion blur score — estimated from the camera motion and the exposure time. The camera motion is calculated from sensor data from the gyroscope and OIS (optical image stabilization). “3A” scores — the status of auto exposure, auto focus, and auto white balance, are also considered. All the individual scores are used to train a model predicting an overall quality score, which matches the frame preference of human raters, to maximize end-to-end product quality. To test this, we collected data from hundreds of volunteers, along with their opinions of which frames (out of up to 90!) looked best. This donated dataset covers many typical use cases, e.g. portraits, selfies, actions, landscapes, etc. Many of the 3-second clips provided by Top Shot had more than one good shot, so it was important for us to engineer our quality metrics to handle this. We used some modified versions of traditional Precision and Recall, some classic ranking metrics (such as Mean Reciprocal Rank), and a few others that were designed specifically for the Top Shot task as our objective. 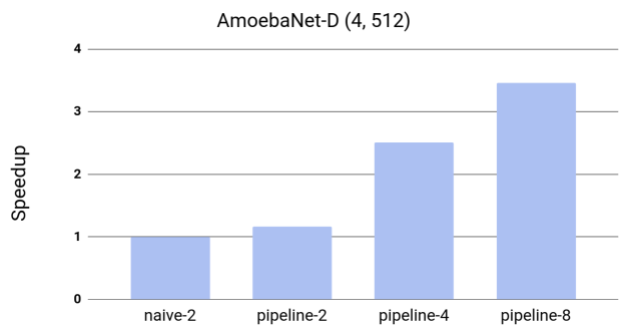 In addition to these metrics, we additionally investigated causes of image quality issues we saw during development, leading to improvements in avoiding blur, handling multiple faces better, and more. In doing so, we were able to steer the model towards a set of selections people were likely to rate highly. Top Shot is just one example of how Google leverages optimized hardware and cutting-edge machine learning to provide useful tools and services. We hope you’ll find this feature useful, and we’re committed to further improving the capabilities of mobile phone photography! This post reflects the work of a large group of Google engineers, research scientists, and others including: Ari Gilder, Aseem Agarwala, Brendan Jou, David Karam, Eric Penner, Farooq Ahmad, Henri Astre, Hillary Strickland, Marius Renn, Matt Bridges, Maxwell Collins, Navid Shiee, Ryan Gordon, Sarah Clinckemaillie, Shu Zhang, Vivek Kesarwani, Xuhui Jia, Yukun Zhu, Yuzo Watanabe and Chris Breithaupt. This entry was posted in Research Blog and tagged Computational Photography, Computer Vision, Google Photos, Pixel, Research on December 20, 2018 by Google AI Blog. Portrait Mode on the Pixel smartphones lets you take professional-looking images that draw attention to a subject by blurring the background behind it. Last year, we described, among other things, how we compute depth with a single camera using its Phase-Detection Autofocus (PDAF) pixels (also known as dual-pixel autofocus) using a traditional non-learned stereo algorithm. This year, on the Pixel 3, we turn to machine learning to improve depth estimation to produce even better Portrait Mode results. Left: The original HDR+ image. Right: A comparison of Portrait Mode results using depth from traditional stereo and depth from machine learning. The learned depth result has fewer errors. Notably, in the traditional stereo result, many of the horizontal lines behind the man are incorrectly estimated to be at the same depth as the man and are kept sharp. As described in last year’s blog post, Portrait Mode uses a neural network to determine what pixels correspond to people versus the background, and augments this two layer person segmentation mask with depth information derived from the PDAF pixels. This is meant to enable a depth-dependent blur, which is closer to what a professional camera does. PDAF pixels work by capturing two slightly different views of a scene, shown below. Flipping between the two views, we see that the person is stationary, while the background moves horizontally, an effect referred to as parallax. Because parallax is a function of the point’s distance from the camera and the distance between the two viewpoints, we can estimate depth by matching each point in one view with its corresponding point in the other view. The two PDAF images on the left and center look very similar, but in the crop on the right you can see the parallax between them. It is most noticeable on the circular structure in the middle of the crop. However, finding these correspondences in PDAF images (a method called depth from stereo) is extremely challenging because scene points barely move between the views. Furthermore, all stereo techniques suffer from the aperture problem. That is, if you look at the scene through a small aperture, it is impossible to find correspondence for lines parallel to the stereo baseline, i.e., the line connecting the two cameras. In other words, when looking at the horizontal lines in the figure above (or vertical lines in portrait orientation shots), any proposed shift of these lines in one view with respect to the other view looks about the same. In last year’s Portrait Mode, all these factors could result in errors in depth estimation and cause unpleasant artifacts. With Portrait Mode on the Pixel 3, we fix these errors by utilizing the fact that the parallax used by depth from stereo algorithms is only one of many depth cues present in images. For example, points that are far away from the in-focus plane appear less sharp than ones that are closer, giving us a defocus depth cue. In addition, even when viewing an image on a flat screen, we can accurately tell how far things are because we know the rough size of everyday objects (e.g. one can use the number of pixels in a photograph of a person’s face to estimate how far away it is). This is called a semantic cue. Designing a hand-crafted algorithm to combine these different cues is extremely difficult, but by using machine learning, we can do so while also better exploiting the PDAF parallax cue. Specifically, we train a convolutional neural network, written in TensorFlow, that takes as input the PDAF pixels and learns to predict depth. This new and improved ML-based method of depth estimation is what powers Portrait Mode on the Pixel 3. 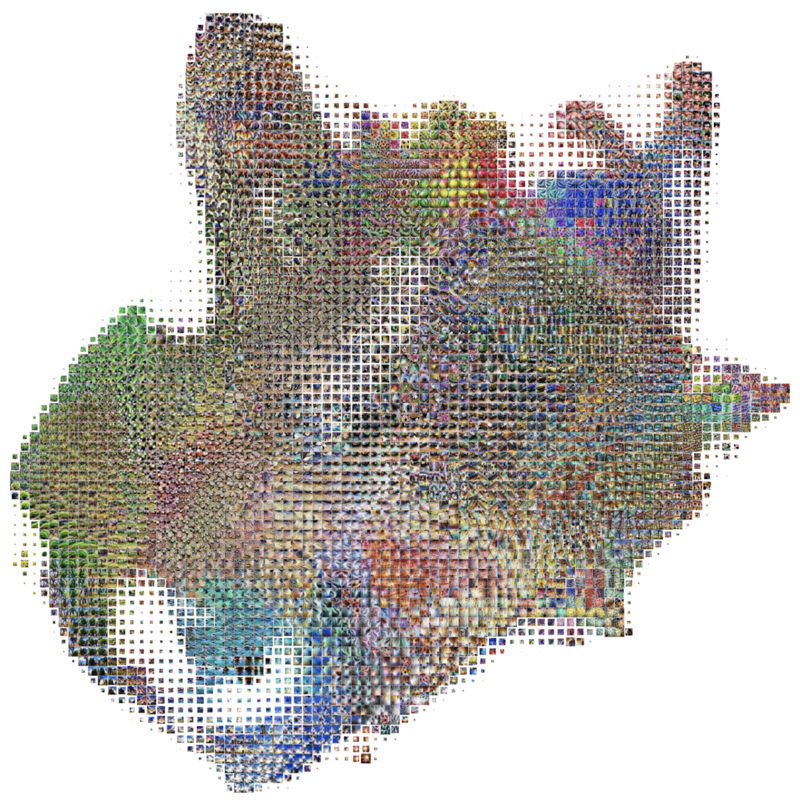 Our convolutional neural network takes as input the PDAF images and outputs a depth map. The network uses an encoder-decoder style architecture with skip connections and residual blocks. In order to train the network, we need lots of PDAF images and corresponding high-quality depth maps. And since we want our predicted depth to be useful for Portrait Mode, we also need the training data to be similar to pictures that users take with their smartphones. To accomplish this, we built our own custom “Frankenphone” rig that contains five Pixel 3 phones, along with a Wi-Fi-based solution that allowed us to simultaneously capture pictures from all of the phones (within a tolerance of ~2 milliseconds). With this rig, we computed high-quality depth from photos by using structure from motion and multi-view stereo. Five viewpoints ensure that there is parallax in multiple directions and hence no aperture problem. The arrangement of the cameras ensures that a point in an image is usually visible in at least one other image resulting in fewer points with no correspondences. The baseline, i.e., the distance between the cameras is much larger than our PDAF baseline resulting in more accurate depth estimation. Synchronization between the cameras ensure that we can calculate depth for dynamic scenes like the one above. Portability of the rig ensures that we can capture photos in the wild simulating the photos users take with their smartphones. However, even though the data captured from this rig is ideal, it is still extremely challenging to predict the absolute depth of objects in a scene — a given PDAF pair can correspond to a range of different depth maps (depending on lens characteristics, focus distance, etc). To account for this, we instead predict the relative depths of objects in the scene, which is sufficient for producing pleasing Portrait Mode results. This ML-based depth estimation needs to run fast on the Pixel 3, so that users don’t have to wait too long for their Portrait Mode shots. However, to get good depth estimates that makes use of subtle defocus and parallax cues, we have to feed full resolution, multi-megapixel PDAF images into the network. 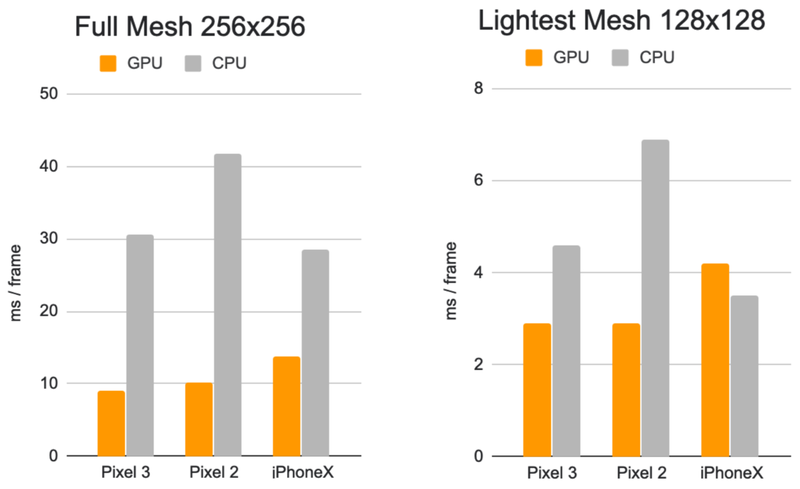 To ensure fast results, we use TensorFlow Lite, a cross-platform solution for running machine learning models on mobile and embedded devices and the Pixel 3’s powerful GPU to compute depth quickly despite our abnormally large inputs. 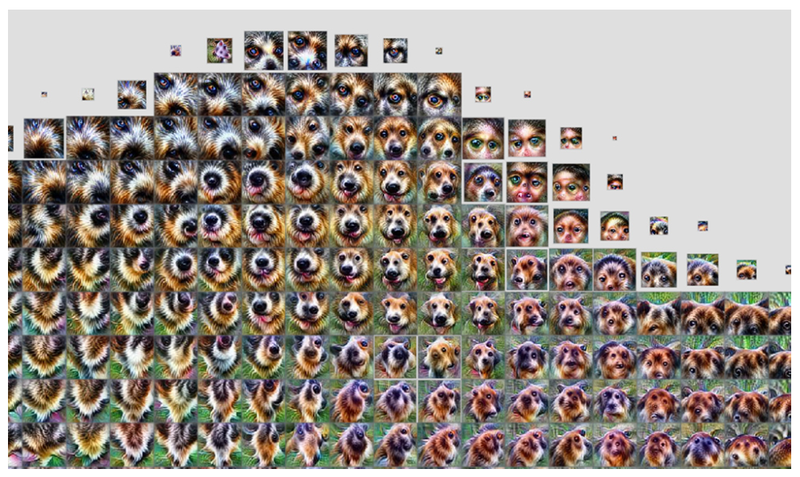 We then combine the resulting depth estimates with masks from our person segmentation neural network to produce beautiful Portrait Mode results. In Google Camera App version 6.1 and later, our depth maps are embedded in Portrait Mode images. This means you can use the Google Photos depth editor to change the amount of blur and the focus point after capture. You can also use third-party depth extractors to extract the depth map from a jpeg and take a look at it yourself. Also, here is an album showing the relative depth maps and the corresponding Portrait Mode images for traditional stereo and the learning-based approaches. This work wouldn’t have been possible without Sam Ansari, Yael Pritch Knaan, David Jacobs, Jiawen Chen, Juhyun Lee and Andrei Kulik. Special thanks to Mike Milne and Andy Radin who captured data with the five-camera rig. This entry was posted in Research Blog and tagged Computational Photography, Computer Vision, machine learning, Pixel, Research on November 29, 2018 by Google AI Blog. Perceiving the depth of a scene is an important task for an autonomous robot — the ability to accurately estimate how far from the robot objects are, is crucial for obstacle avoidance, safe planning and navigation. While depth can be obtained (and learned) from sensor data, such as LIDAR, it is also possible to learn it in an unsupervised manner from a monocular camera only, relying on the motion of the robot and the resulting different views of the scene. In doing so, the “ego-motion” (the motion of the robot/camera between two frames) is also learned, which provides localization of the robot itself. While this approach has a long history — coming from the structure-from-motion and multi-view geometry paradigms — new learning based techniques, more specifically for unsupervised learning of depth and ego-motion by using deep neural networks, have advanced the state of the art, including work by Zhou et al., and our own prior research which aligns 3D point clouds of the scene during training. Despite these efforts, learning to predict scene depth and ego-motion remains an ongoing challenge, specifically when handling highly dynamic scenes and estimating proper depth of moving objects. Because previous research efforts for unsupervised monocular learning do not model moving objects, it can result in consistent misestimation of objects’ depth, often resulting in mapping their depth to infinity. 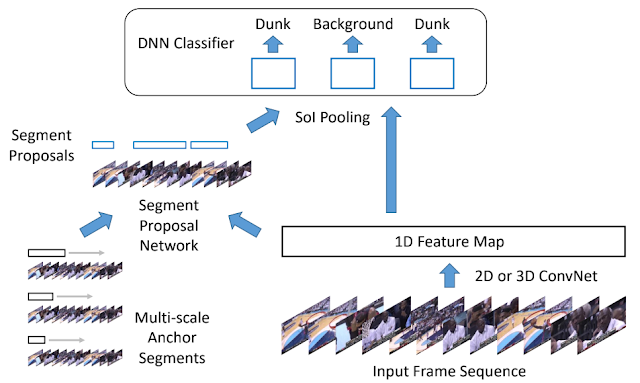 In “Depth Prediction Without the Sensors: Leveraging Structure for Unsupervised Learning from Monocular Videos”, to appear in AAAI 2019, we propose a novel approach which is able to model moving objects and produces high quality depth estimation results. Our approach is able to recover the correct depth for moving objects compared to previous methods for unsupervised learning from monocular videos. In our paper, we also propose a seamless online refinement technique that can further improve quality and be applied for transfer across datasets. Furthermore, to encourage even more advanced approaches of onboard robotics learning, we have open sourced the code in TensorFlow. Previous work (middle row) has not been able to correctly estimate depth of moving objects mapping them to infinity (dark blue regions in the heatmap). Our approach (right) provides much better depth estimates. A key idea in our approach is to introduce structure into the learning framework. That is, instead of relying on a neural network to learn depth directly, we treat the monocular scene as 3D, composed of moving objects, including the robot itself. The respective motions are modeled as independent transformations — rotations and translations — in the scene, which is then used to model the 3D geometry and estimate all the objects’ motions. Additionally, knowing which objects may potentially move (e.g., cars, people, bicycles, etc.) helps us learn separate motion vectors for them even if they may be static. By decomposing the scene into 3D and individual objects, better depth and ego-motion in the scene is learned, especially on very dynamic scenes. We tested this method on both KITTI and Cityscapes urban driving datasets, and found that it outperforms state-of-the-art approaches, and is approaching in quality methods which used stereo pair videos as training supervision. Importantly, we are able to recover correctly the depth of a car moving at the same speed as the ego-motion vehicle. This has been challenging previously — in this case, the moving vehicle appears (in a monocular input) as static, exhibiting the same behavior as the static horizon, resulting in an inferred infinite depth. While stereo inputs can solve that ambiguity, our approach is the first one that is able to correctly infer that from a monocular input. Previous work with monocular inputs were not able to extract moving objects and incorrectly map them to infinity. Example depth results for a dynamic scene together with estimates of the motion vectors of the individual objects (rotation angles are estimated too, but for simplicity are not shown). In addition to these results, this research provides motivation for further exploring what an unsupervised learning approach can achieve, as monocular inputs are cheaper and easier to deploy than stereo or LIDAR sensors. 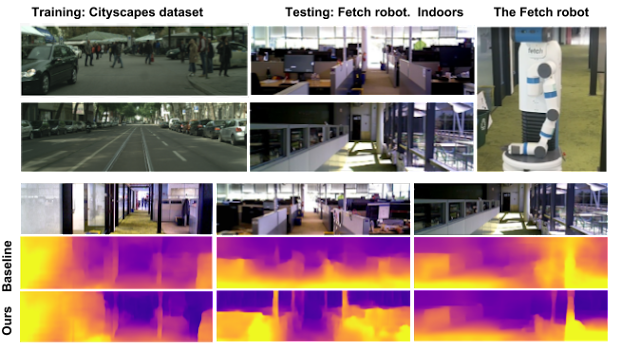 As can be seen in the figures below, in both the KITTI and Cityscapes datasets, the supervision sensor (be it stereo or LIDAR) is missing values and may occasionally be misaligned with the camera input, which happens due to time delay. Depth prediction from monocular video input on the KITTI dataset, middle row, compared to ground truth depth from a Lidar sensor; the latter does not cover the full scene and has missing and noisy values. Ground truth depth is not used during training. Depth prediction on the Cityscapes dataset. Left to right: image, baseline, our method and ground truth provided by stereo. Note the missing values in the stereo ground truth. Also note that our algorithm is able to achieve these results without any ground truth depth supervision. Our results also provide the best among the state-of-the-art estimates in ego-motion, which is crucial for autonomous robots, as it provides localization of the robots while moving in the environment. The video below shows results from our method that visualizes the speed and turning angle, obtained from the inferred ego-motion. While the outputs of both depth and ego-motion are valid up to a scalar, we can see that it is able to estimate its relative speed when slowing down and stopping. Depth and ego-motion prediction. Follow the speed and the turning angle indicator to see the estimates when the car is taking a turn or stopping for a red light. An important characteristic of a learning algorithm is its adaptability when moved to an unknown environment. In this work we further introduce an online refinement approach which continues to learn online while collecting new data. Below are examples of improvement of the estimated depth quality, after training on Cityscapes and online refinement on KITTI. Online refinement when training on the Cityscapes Data and testing on KITTI. The images show depth prediction of the trained model, and of the trained model with online refinement. Depth prediction with online refinement better outlines the objects in the scene. We further tested on a notably different dataset and setting, i.e. on an indoor dataset collected by the Fetch robot, while the training is done on the outdoor urban driving Cityscapes dataset. As to be expected, there is a large discrepancy between these datasets. Despite this, we observe that the online learning technique is able to obtain better depth estimates than the baseline. 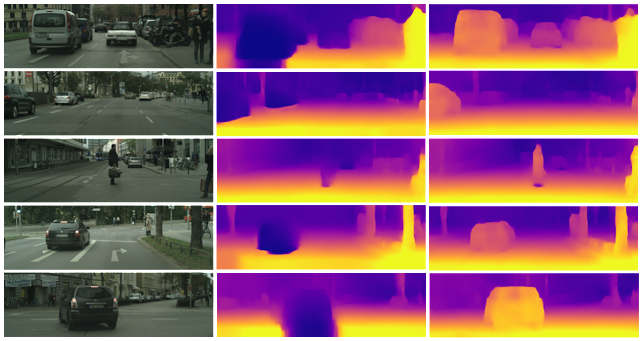 Results of online adaptation when transferring the learning model from Cityscapes (an outdoors dataset collected from a moving car) to a dataset collected indoors by the Fetch robot. 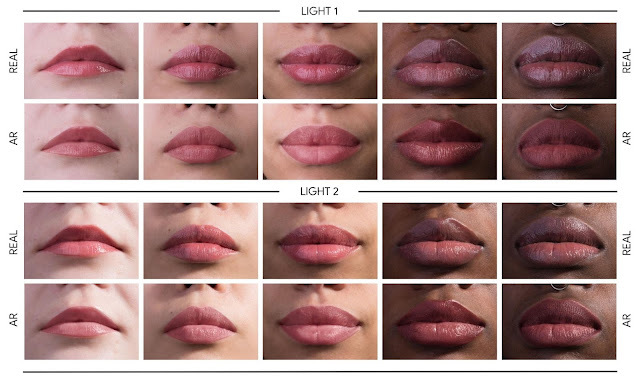 The bottom row shows improved depth after applying online refinement. In summary, this work addresses unsupervised learning of depth and ego-motion from a monocular camera, and tackles the problem in highly dynamic scenes. It achieves high quality depth and ego-motion results and with quality comparable to stereo and sets forward the idea of incorporating structure in the learning process. More notably, our proposed combination of unsupervised learning of depth and ego-motion from monocular video only and online adaptation demonstrates a powerful concept, because not only can it learn in unsupervised manner from simple video, but it can also be transferred easily to other datasets. This research was conducted by Vincent Casser, Soeren Pirk, Reza Mahjourian and Anelia Angelova. We would like to thank Ayzaan Wahid for his help with data collection and Martin Wicke and Vincent Vanhoucke for their support and encouragement. This entry was posted in Research Blog and tagged AI, Computer Vision, deep learning, Research, Robotics on November 27, 2018 by Google AI Blog.